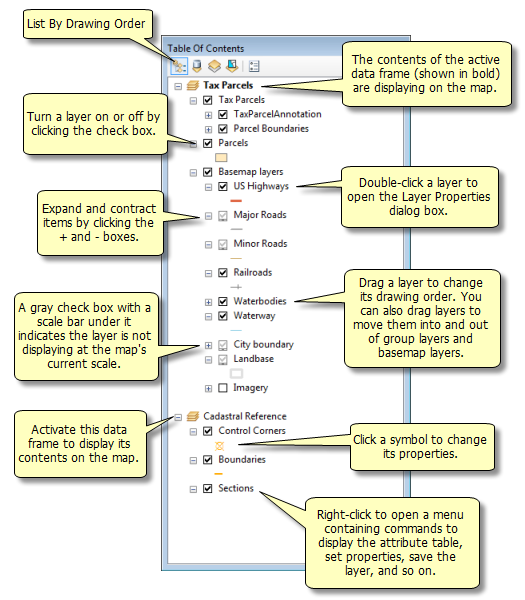 The table of contents lists all the layers on the map and shows what the features in each layer represent. 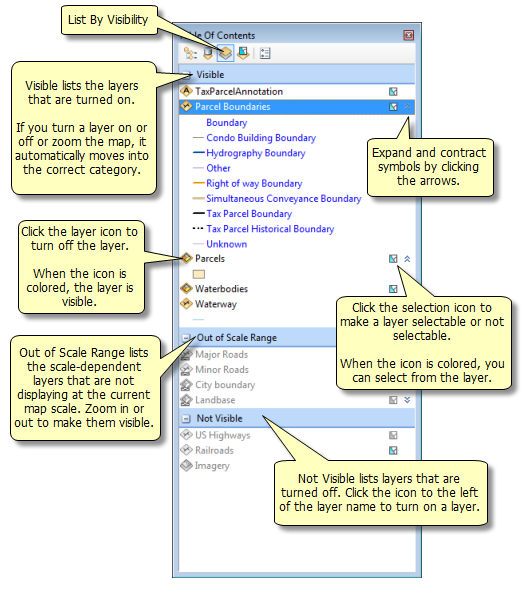 The map's table of contents helps you manage the display order of map layers and symbol assignment, as well as set the display and other properties of each map layer. The layers at the top of the table of contents draw on top of those below them. Thus, you'll put the layers that form the background of your map, such as the ocean or an image, near the bottom of the table of contents and the layers to which you want to draw the map reader's attention near the top. A typical map might have an image or a terrain base (such as shaded relief or elevation contours) near the bottom. Next, comes basemap polygon features, followed by line and point features near the top. And finally, you might typically see some reference layers, such as road names and place-names, that provide locational context. You use the check box or icon to the left of each map layer to turn it on or off. Holding down the CTRL key and clicking turns all map layers on and off simultaneously. You can set the display properties for each map layer so that it draws within a specific range of map scales. When the map display is out of range for scale-dependent drawing, the layers will not be visible. Layers that are out of range of the current map scale are indicated in the table of contents by a gray check box with a scale bar under it. The table of contents has several ways of listing layers: by drawing order, source, and whether layers are visible or selectable. Click the icon at the top of the tab to switch between these grouping methods. You can tell which mode is active by looking at the button (the active one is highlighted) and the organization of the items in the table of contents. The different ways of listing layers are simply methods of displaying information about the same layers. Use List By Drawing Order to author the contents of your map, such as to change the display order of layers on the map, rename or remove layers, and create or manage group layers. All the data frames in your map are listed when the table of contents is sorted by drawing order. However, only the active data frame—indicated by a bold data frame name—is shown in the map in data view. The order of layers determines how layers are drawn on a map. Within a data frame, the layers listed at the top will draw over those in the list below them, and so on, down the list. You can easily drag and drop layers to adjust their drawing order or organize them in separate data frames. To turn on or off a layer, click the check box next to the layer's name. Right-clicking opens a menu containing many commands for working with layers, including accessing their properties, zooming to them, selecting from them, and opening their attribute tables. Click List By Source to show the layers in each data frame with the layers organized by the folders or databases in which the data sources referenced by the layers can be found. This view will also list tables that have been added to the map document as data. This view is very useful for managing and repairing each layer's path reference to its data source in your map document. Click List By Visibility to see a dynamic listing of the layers currently displayed in the active data frame. The way layers are listed updates automatically as you pan and zoom, interact with the map, select features, and turn layers on and off. Listing layers by visibility helps you visually simplify and organize a detailed or complicated map with many layers. Since the organization of the table of contents visibility list is controlled automatically, you cannot change the order or groupings of layers manually. 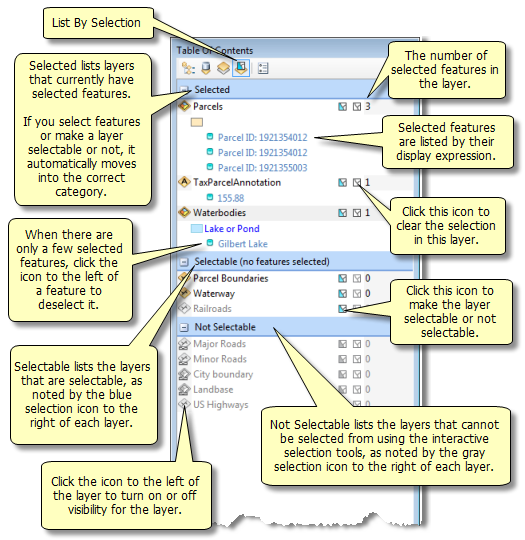 Layers within a group layer are listed individually, since each layer can have its own visibility and selection properties. You can choose to display the group layer's name beside the layer's entry on the Table Of Contents Options dialog box. With List By Visibility, you have visual cues to indicate the layer's visibility. Each type of layer has its own icon, and the symbol is either colored to indicate the layer is on or gray when it is not, so you can quickly look at the icon to determine whether a layer is visible. Visible—The layer is turned on. Out of Scale Range—The layer has a visible scale range and is not being displayed at the current map scale. To bring it back into view, right-click and click Zoom To Make Visible. Not Visible—The layer is turned off. To turn it back on, click the icon to the left of the layer name. When you right-click a layer name, the menu that appears contains the same commands as the menu for listing layers by drawing order and selection. To turn a layer on or off, click the layer icon to the left of the layer name, such as for a line layer or for a polygon layer. To make a layer selectable or not selectable, click the selection icon to the right of the layer name. If that icon is colored , the layer is selectable; if it is gray , the layer is not selectable. Click List By Selection to group layers automatically by whether or not they are selectable and have selected features. A selectable layer means that features in the layer can be selected using the interactive selection tools, such as those on the Tools toolbar or the Edit tool, when in an edit session. Selected—The layer has features selected. Selectable (no features selected)—The layer is selectable, but it has no features currently selected. Not Selectable—The layer is not selectable, and you cannot use the interactive selection tools to select features in it. Similar to listing layers by visibility, you can turn a layer on or off using the layer icons to the left of the layer name, such as for a line layer or for a polygon layer, and make a layer selectable or not selectable using the icon to the right of the layer name. In addition, the number of selected features is listed next to the selection icon. When there are selected features, you can clear the selection by clicking the white selection icon in the column between the selectable icon and number of selected features. When you right-click a layer name, the menu that appears contains commands that work with selections. You can navigate to selected features, clear the selection, create a selection layer, open the table showing the selection, and so on. When only a few features are currently selected, the selected features are listed individually under the layer name. The square icon next to the feature ID allows you to refine which features are selected; clicking the box deselects that particular feature. With a large number of selected features, the layer's entry does not include this icon. You can turn off this setting altogether on the Table of Contents Options dialog box. The ID of the feature is obtained from the layer's display expression, which is set on the Display tab of the Layer Properties dialog box. 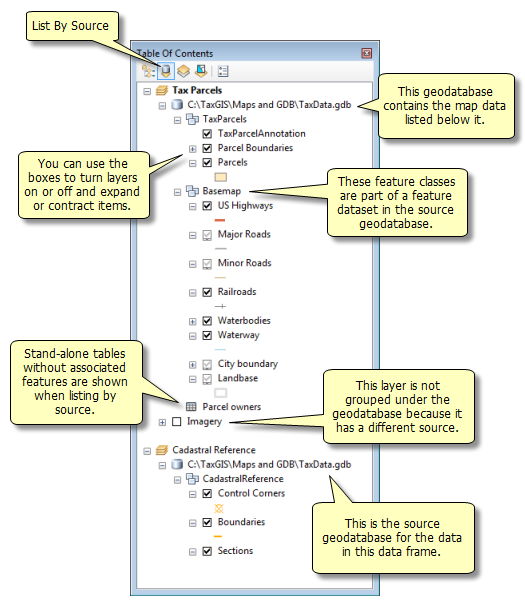 Knowing whether layers are selectable or have selected features is particularly useful when editing, running geoprocessing tools (any tool that accepts layers considers the selected features), or performing other tasks that operate on selected features. For example, when copying features, both the editing environment and the Copy Features geoprocessing tool will copy only the selected features. You can list the table of contents by selection and easily see which layers have a selection. Layers containing at least one selected feature are automatically promoted to the top of the window, so you can avoid scrolling or sifting through a long layer list looking for layers with selected features. 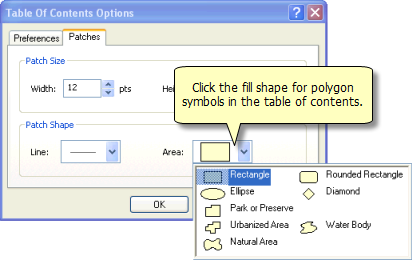 In addition, even though a layer is designated as not selectable and you cannot use the interactive selection tools to select its features, it is still possible to select from that layer using other methods of selection—such as with the table window, Select By Location, or Select By Attributes. You can use the Options button on the table of contents to set display properties. This will display the Table of Contents Options dialog box. Check Show selected features in selection list to list selected features individually when the table of contents items are grouped by selection. This allows you to refine the selection, since you can click a feature in the table of contents to deselect it. When unchecked, only layer names will appear in the table of contents. Click Sort layers by and click whether to sort them by the order layers are drawn or alphabetically by layer name. Check Show group layer name to include the name of a group layer next to the layer's name when the table of contents is listed by visibility or selection. 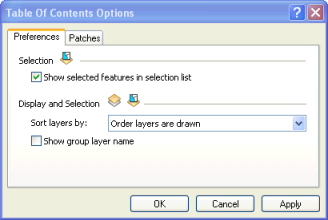 Since each layer in a group layer can have its own visibility and selection statuses, layers are not listed with their parent group. When unchecked, the group layer's name will not appear next to any child layers. List the table of contents by drawing order to create and manage group layers. On the Patches tab, you can change the patch size or shape as desired. Patches are the geometric shape that is used to represent a specific kind of feature in the table of contents. (The patches in a map legend are set separately when you create a legend.) 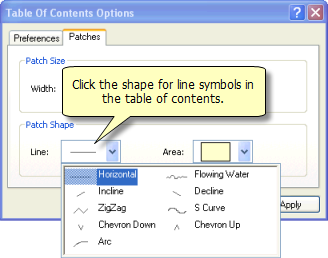 Click the Line or Area symbol and click the desired symbol from the list.